Back in early 2005, I covered URLwell, a clever menu-bar program that made it easy to store URLs you want to check out at a later time. Unfortunately, URLwell was last updated less than a month after I wrote that review, but I recently discovered a candidate for replacement: Quiet Read, which adds a few useful features of its own. You can view any saved URL by double-clicking it in the Quiet Read menu, or by selecting it and pressing Command+Return. (Why not just Return? Good question.) To delete an item, select it and press Command+Delete, or use the action menu at the bottom of the menu. (Pressing Option+Command+Delete opens a URL and deletes it from the menu simultaneously.) You can rename a URL by Option-clicking it—an action you'll likely perform frequently, as I found that a fair number of URLs display “Unknown title” as their name, instead of the actual page name, when added to Quiet Read. Most of the program’s features are accessible using keyboard shortcuts or keyboard navigation; in fact, you can access the menu itself using the keyboard shortcut of your choosing. 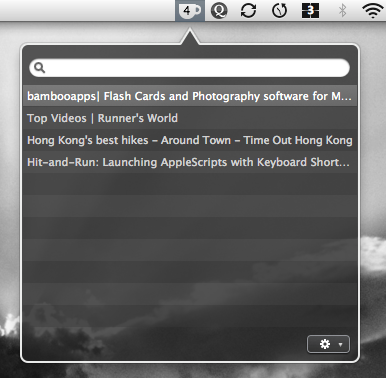 These features are free, but if you purchase the Pro version of Quiet Read for $10, you get a useful search/filter feature for quickly finding a link in the menu; the capability to send URLs to Instapaper and Read it Later for offline reading (and better formatting); and the capability to shorten URLs (using the tr.im service) for easier pasting in e-mail, Twitter messages, and the like. Like URLwell, Quiet Read isn’t a bookmark manager; it’s for temporarily storing sites that you want to visit “sometime,” keeping them handy so you don’t forget them. Still, there are a few simple URL-management features I’d like to see, such as the capability to reorder URLs. Quick Read also has a few limitations in addition to those I mentioned above. For example, unlike URLwell, there’s no way to track which URLs you’ve visited, and you can’t export your stored URLs to a text or HTML file. You also can’t drag multiple URLs—or a text file containing URLs—into Quiet Read. And I find Quiet Read’s shades-of-gray color scheme to be difficult to read. Finally, Quiet Read’s menu behaves a bit oddly, requiring you to double-click the icon to display the menu. Still, Quiet Read is, like URLwell, a better solution for storing URLs than tossing them in a text file or keeping a folder of Internet Location files in the Finder. And it provides more features than if you just saved those URLs to a bookmark folder in your browser. I’m looking forward to future versions.